The spacious and versatile Simba Suite has two large single beds in the bedroom, but for those with kids in tow, there’s plenty of room to add more beds and cots. The cosy living area surrounds an enormous fireplace to keep the whole family warm in the Nairobi winter. For the summer sun however, there is a massive verandah, partly covered, that leads straight into the spectacular gardens. It’s ideal for friends or colleagues looking to have a bit of elegance and luxury while sharing the cost, or a family who want a home away from home, with the freedom of a garden on your private doorstep. After a day’s hot and dusty meandering, sit on the terrace with an ice cold Tusker (or three) and watch the last rays of Kenya’s orange sun disappear behind the iconic Ngong hills. Let the kids loose in the garden, where they can find a jungle gym, the resident dog (and a soccer ball in the bushes if they’re lucky) to keep them amused. Make yourself at home in one of our 5 unique and spacious rooms, and take a ramble through the lush grounds. Cheer on your favorite sports teams on the big screen in the bar, inspire those green fingers with a visit to our garden centre or pamper yourself in our beauty salon. Foodies, kids, grown-up kids, sports fans, chillaxers, weekend get-away-ers, international explorers; there is something for everyone at the Purdy Arms, so come and see for yourself. This beautiful yet quirkily designed B&B arose from a derelict colonial home that belonged to the Purdy family in the 1950’s. It’s changed occupations a few times since then, but now shines in its new role as the Purdy Arms; watering hole and restaurant, homely B&B, playpen for all ages. Most of the original features remain; hence it's unique mix of old and new, an idiosyncratic restoration. We opened in mid November 2012, with our bar being affectionately called “The Rehab,” a throw-back to one of the houses previous vocations. Situated on 22 acres, the main building overlooks lush gardens full of indigenous trees and resident wildlife; including vervet monkeys, duikers, a pair of owls and a couple of our regulars. The restaurant offers a choice of fine dining or good old pub grub, that can be enjoyed in the bar, out on the terrace or even in our private dining area. We are not a big chain hotel with standardized rooms that caters to the masses, and we don’t aim to be. 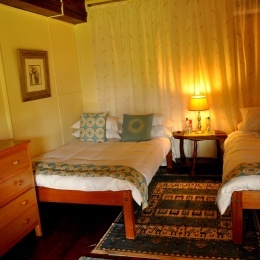 Our 5 unique rooms each have a different character and appeal; the only common theme between them is the homespun atmosphere they radiate. We definitely had a fantastic visit. We'll surely be coming back. It was great. Everything was absolutely fantastic. They were very accommodative of us even when we checked in quite late and that, we liked. Will be going back.